As you might know I love to speak about my passions. As CEO of Ace Jewelers Group of Amsterdam,www.AceJewelers.com I have been invited to speak during the Webwinkel Vakdagen 2016 (#WWV16). 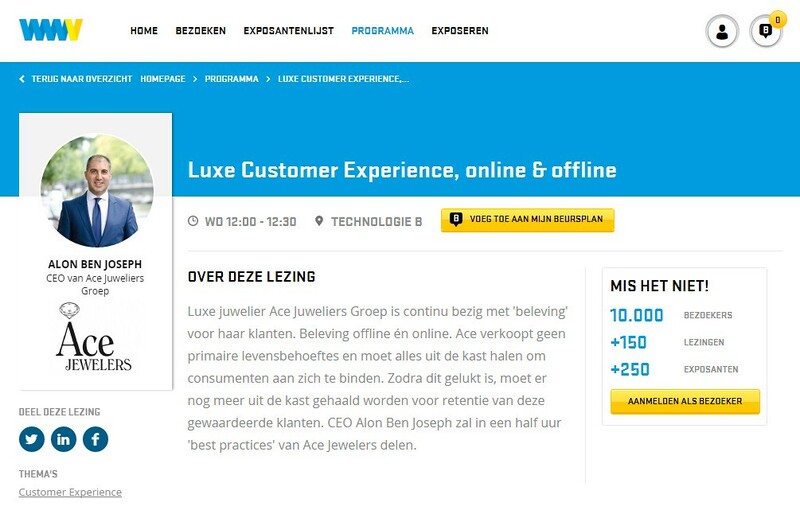 I will speak about Customer Experience in the luxury industry on Wednesday January 20th, 2016 in Utrecht, The Netherlands. The Webwinkel Vakdagen, also know as WWV, is the leading event in the Dutch Internet industry and this is the 10th anniversary edition. In 2006 it was the first time I have attended and it is amazing to see how the fair has grown to an industry meet-up you can not miss! The title of my presentation is: Luxury Customer Experience, online and offline. I will elaborate on critical success factors of Ace Jewelers in creating the ultimate customer experience in the luxury industry we operate in. Hope to see you at my lecture at noon on the 20th of this month. For an overview of all my speaking engagements, please visit this page. Will ‘smart watches’ and ‘wearables’ kill the Swiss watch industry? The last two years I have been asked many times if I believe that the so-called ‘smart watches‘ and ‘wearables‘ will conquer the valuable ‘wrist real estate‘ from the Swiss watch brands on all of our wrists. My answer is always and unconditionally: NO! Ace Jewelers was the first Dutch jeweller to sell smart watches. 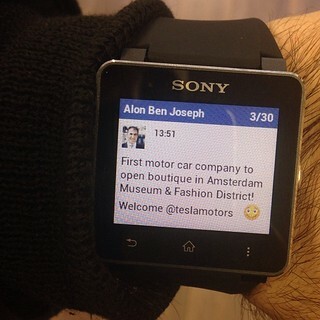 Here is the Sony Smart Watch on my wrist. I hear you saying: “This Alon is not objective! Not only is he a jeweller and salesman of watches, but also an enormous WatchFreak!” I am indeed guilty of selling watches and privately a huge watch fanatic, but I do believe that I am objective and able to give an answer to this question as I have always ‘lived’ in this industry (the watch industry) and also grown up with electronics. 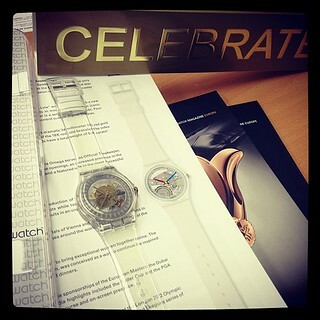 I still collect Swatch watches today. This is 30th anniversary limited edtion launched in 2013. Do I think that this is true? No, I do not think we will have a huge ‘live-threatening crisis’ for the (luxury) watch industry on our hands, but I do think that the luxury industry (watches, fashion, cars, etc) are lagging, frozen in their old ways and will get hit… Hit hard. So, it might be a bold statement, but I do dare to say that the luxury industry and the watch industry in particular are on the brink of a huge revolution, after having a great, smooth and exponential growing evolution (for at least three decades)… We all know that (smooth) evolutionary periods are abruptly interrupted by (unexpected and) game-changing revolutions. Why do I still sound so positive, if that is my opinion/view? Well, I believe that as society, consumer behavior and norms & value change, and they are changing faster than ever before, we will see that we will utilize our ‘wrist real estate’ better… We have two wrists 🙂 So, it doesn’t mean that consumers will throw away their mechanical watches and automatically swap it to a digital smart watch/device. I also expect that eco-friendly smart watches will not only be powered by, for example solar power, but maybe also by (kinetic) mechanical automatic movements… Hybrid watches… Remember the Japanese Seiko Kinetic movements or the Swiss AutoQuartz movements made by ETA (and used by Omega, Tissot and Swatch for example)? But, on the other hand, I do believe that the marketing and communication needs to change by the premium brands that manufacture ‘old school’ mechanical watches. As the newest generation that know how to use smart phones and tablet computers before they even know how to crawl or feed themselves, will not even want to wear anything (besides some 3D printed jewelry maybe) on their wrists, arms or any body part for that matter… The sole reason that the Swiss (high-end) watch industry recovered after the Quartz Crisis, is because watches become an even bigger status symbol that it was before the Quartz Crisis in the 1970s and that it gave the owner a romantic sense of feeling and nostalgia. I do not think this will fade with the growing usage of smart devices markets. “An interesting article that appeared recently in The Economist (“The high-tech world of old-world watches”) offered a different take on the implications of the approaching tidal wave of smart watches. The premise of the article is that there is a great deal more innovation in the art of mechanical watchmaking than in supposedly “smart” watches. And despite the fact that almost two million were sold last year, Endeavour Partners in the USA found that one-third of buyers tire of them rapidly, and simply stop wearing them within six months. You might wonder what I do with my two wrists. Well, I often (but not always) wear two wrist watches, one on each wrist. It has nothing to do with telling time or having access to two different time zones simultaneously, but do so exclusively due to my obsessive love for the art of watchmaking. Yes, I do own pocket watches and no, I never wear them. And, yes, I do love technology and innovation too. It took me a while to decide if I do want to be a (volunteer) victim of the all new all connected world and I decided that I do and I decided to test a UP by Jawbone bracelet. I just ordered my first one on Amazon yesterday. But, I am also one of these consumers that Maillard refers to: I do not always want to be online. I think we all have this contradiction in us: we often are ‘stuck in this rat race’ of being on top of things all the time (read: super connected and online), where-as (for example in the weekend or during holidays) we embrace and cherish our (complete) downtime (read: unconnected and offline). To conclude this article/post/my ‘two cents’: I do not think that smart watches like the iWatch by Apple and/or wearables like the UP by Jawbone will kill the premium watch industry. But, I do think that if the watch industry does not at least acknowledge and even better, embrace the new technologies and listen very carefully to the wishes of the (new generation of) consumers, many brands in this industry will perish. And, the gaps in the market will be filled by the Apples, Samsungs and the ‘many Kickstarter projects that we can expect’ of this world. A new generation has already grown up with touch screens, uses smart phones and tablet computers, and these kids will not automatically surrender their wrist to a ‘weird thing on your wrist with a strap that can only tell time’ (that maybe is possible indicated the date and if you are lucky has a chronograph)… They need a totally different method and argument of convincing to buy a watch that needs to be wound by hand, wrist movement, or even worst, can’t be charged by themselves as it has an old school battery inside…. 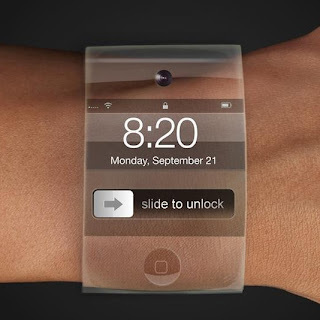 When I wrote this article the iWatch was not launched yet, and this picture shows an impression of how it could look like. PLEASE DO SHARE YOUR TWO CENTS ON THIS SUBJECT HERE BELOW. On May 11th, 2012 I already published a post about the launch of a new book we were working on at Ace Jewelers. I am proud to announce that we presented the physical book at the beginning of this month: “The Ace List – Volume I” with an unique ISBN number: 9789081922807. Amsterdam, September 12th, 2012 – Amsterdam based Ace Jewelers Group has presented a completely new concept in customer information. It consists of an impressive book, The Ace List, plus a dedicated website, www.TheAceList.com. Together, both media represent a new standard in communication about watches and jewels. 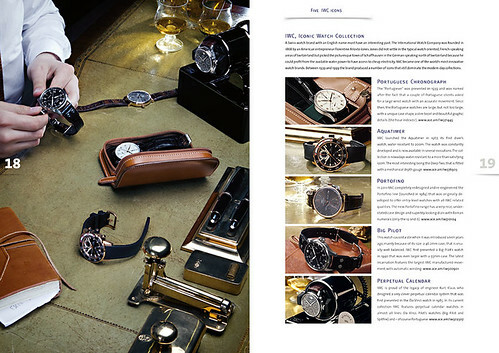 The coffee table book is offering a kaleidoscopic view on the world of watches, jewelry and luxury living; the website – among others – offers clients the possibility to create their own lists of favorites. It’s not the first time Ace Jewelers Group introduces new ways of information and marketing. The company is a pioneer of cross-channel retailing and operates classic jewelry boutiques next to digital e-boutiques. Ace was the first jeweler being authorized by the best brands to sell products online. Ace combines an innovative spirit with a dedication to quality. For this reason the group co-operated with MotoMax Media (a pioneer of combining traditional printed media with a strong online presence) to create a stunning book and accompanying website. All content was created specifically for this project. 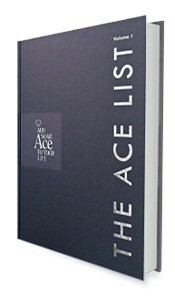 The Ace List (Volume 1) is a hard cover publication of 100 large size pages. It presents important watches and jewels in a selection of Top Five Lists, but adds playful articles about the five best vintage watches, Hollywood brands, milestones in watch history, places to long for, marriage proposals, honeymoon destinations, planes and more! This combination of product oriented and lifestyle based subjects turns The Ace List into a most inspiring read. The Ace List (ISBN 9789081922807) is for sale for € 20,- (USD 25, GBP 15) via www.amazon.com, www.AceJewelers.com, www.bol.com, and www.0024.nl. This surprised me a bit and made me curious if there is a serious business (plan) behind this, or it’s just a good marketing stunt?! “A simple and brilliant principle: put your money in and pick your gold! 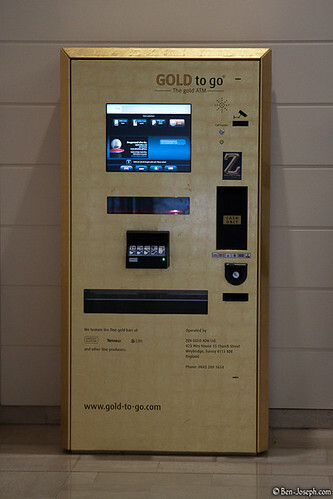 The GOLD to go™ vending machine is an unmanned point of sale. It offers an extraordinary opportunity to purchase gold bars and coins of assured quality, backed by the security of a Swabian Fort Knox® and with the ease-of-use of a vending machine. Prices are updated in real-time. The GOLD to go™ gold vending machine is largely burglar-proof and tamper-resistant. It has an excellent user guidance, which makes it very easy to handle. Today, there are already 27 ATM machines installed: 15 in Germany, 8 in The UAE, 2 in Italy and one each in The USA and The UK. As you know I love retail, I love watches and I love fashion. One of my favorite shoe manufacturers is the Italian firm: Santoni. This year IWC and Santoni teamed up and the new IWC Portofino watch collection will be supplied with handmade Santoni watch straps. Great synergy and two brands adding value.